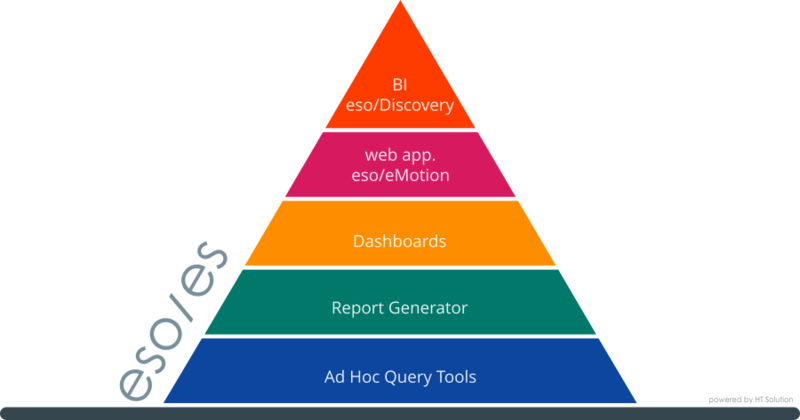 With your eso/Discovery you can do practically any type of business analyses and display all of your company’s data available in your information system. A Business Intelligence (BI) solution, it is suitable for all management levels. Your eso/Discovery data is displayed in three different forms: as a list, as an aggregate list and as a graph, all of them mutually synchronised. For example, when you select an area from the chart or create a list, the other components react at once. Sorting, choosing and filtering data intuitively as well as getting more details throughout the system is a matter of course. You have fast filters, date buttons and a “search” field at the top of the screen. Besides your own individual views - which you have defined to meet your specific needs - you have other standard options such as TOP 5 (10, 30), BOTTOM 5 (10, 30), ABC Analysis, Timeline, and Compare, which allows you to compare data for different periods. You can design your own views and save them for you or a group of users to view or edit later on. Charts can easily be exported into presentations and figures into Excel. eso/Discovery is an intuitive tool that requires virtually no training and is ready to run right after it is installed. Your data is stored using unique high-speed in-memory technology - which is many times faster than OLAP databases while taking just 10% of their memory. Your data in eso/discovery is connected with your eso/es information system, so no interface between your ERP and your BI is needed. Your eso/es information system has sophisticated data analysis tools, which are arranged hierarchically to be used at all levels, from regular users up to top managers. In eso / es, you can quickly and intuitively obtain basic information (totals, amounts, as well as maximum, minimum, and average values) for the selected rows of any numeric column in every list. The rows can be selected using fast standard and customised filters. These filters can be saved to be used for further searches. Users will probably manage most of their regular system work using just this tool. This eso/es app offers you hundreds of standard reports (lists) for every area. You can specify your own selection and sorting conditions, add and remove columns, define subtotals and column styles, and a lot more. The resulting report can be modified and saved to be used by a user, a group, or the whole company. The best about Generator Report is that it can compare any numerical data by intuitively assigned periods (years, months, quarters, weeks, or days). In a single window, your Dashboard displays all the essential information from the different areas in the form of a list, a graph, and an indicator (a speedometer). Alerts will appear when a predefined condition occurs. The Dashboard can appear right after logging into the system, or it can form part of the application’s desktop. One user can have several Dashboards. 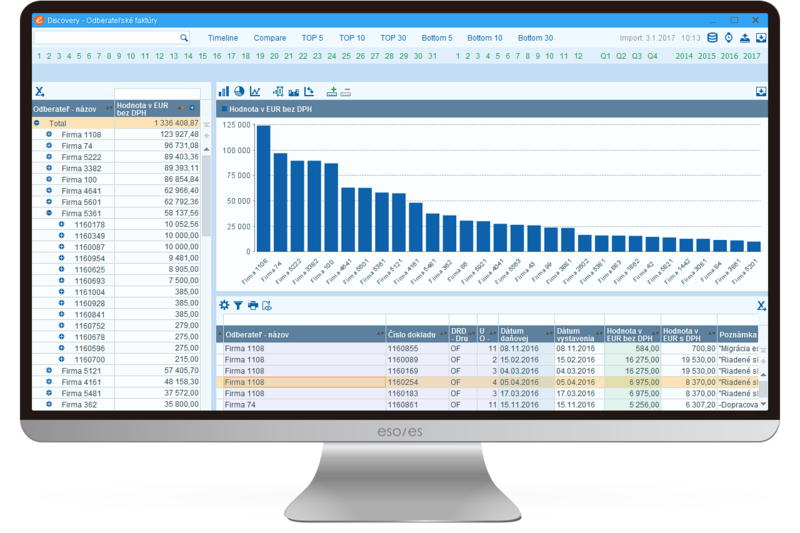 This analytical tool for management and business, which is connected to eso/es using powerful in-memory technology, offers you fast, intuitive, and immediately available pre-defined TOP 5 (10, 30) BOTTOM 5 (10, 30), ABC analysis, Timeline and Compare views.